B Movie Nation | Announcing the 2nd Annual Golden Cob Awards! Announcing the 2nd Annual Golden Cob Awards! For the second year, The B Movie Celebration will be hosting the coveted Golden Cob Awards for Excellence in B Movies. This year The B Movie Celebration is asking your help in determining who gets the Cob. For a generation of science fiction and B-movie enthusiasts, Mr. Wilkins was the bespectacled TV host who drolly introduced underground flicks with titles such as “Attack of the Mushroom People.” Smoking his trademark cigar and making dry jokes about the questionable quality of the movies, Wilkins became a late-night horror institution in the Bay Area in large part because of his deadpan humor, quick wit and unpretentious attitude. Though he entered into the business with little knowledge about horror and science fiction — frequently deferring to the expertise of staff and special guests on the show — Wilkins got the opportunity to interview genre icons such as Christopher Lee and Boris Karloff. 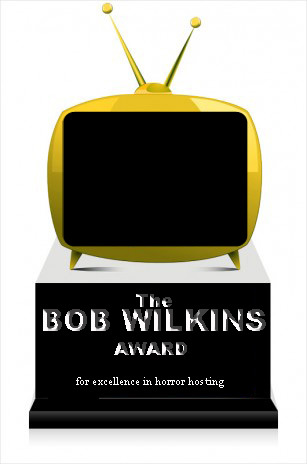 Tagged B Movie Celebration, Bob Wilkins, Cob Awards. Bookmark the permalink.